Aerocene is an artistic project, a collective endeavour that is being currently developed by a team, united under a non-profit organisation. Aerocene manifests as a series of air-fuelled sculptures that will achieve the longest, emission-free journey around the world: becoming buoyant only by the heat of the Sun and infrared radiation from the surface of Earth. The sculptures float without burning fossil fuels, without using solar panels and batteries; and without helium, hydrogen or other rare gases. 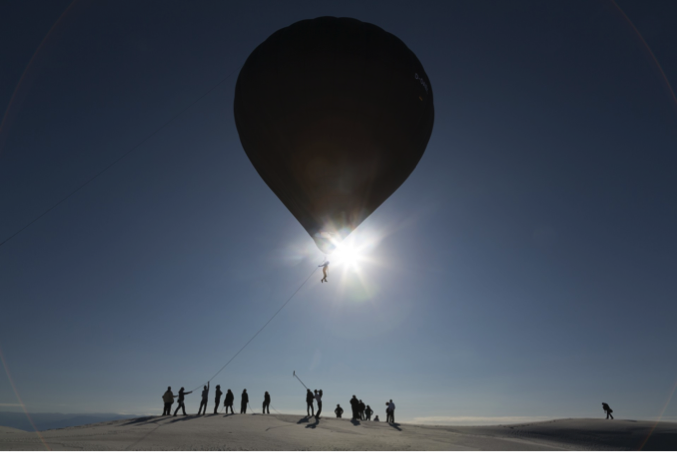 The Aerocene D-O AEC air-filled sculpture successfully carried passengers without any use of propane for nearly three hours in a collaborative experiment in November 2015 in White Sands, New Mexico, achieving the first and longest purely solar-powered, certified, lighter-than-air tethered flight. Aerocene is a fully open project, relying on worldwide social action and interaction, and aiming at mobilizing groups of individuals for multiple concrete solutions for our common environment. Aerocene is related to Cloud Cities, a project focusing around the idea of cities in the sky, a speculative project by Tomás Saraceno. Aerocene is an open participatory platform of knowledge production and distribution. The Aerocene action and project enlivens the discussion on 2-degree climate thresholds; it materialises debates on climatic shifts in social, collaborative practices. The sculpture sets the road for the most sustainable and energy efficient vehicle humans have ever created. Artists, lighter-than-air aeronautical engineers, balloonists, scientists, climate activists, public.